“China Builds the Bomb” is the title of a 327-page book written by two American nuclear scientists and published in 1988. I bought this book as soon as it hit the bookstores. Indeed, the book invited the readers to pay special attention to Chapter “China’s Nuclear Weapons Tests, 1964-1978” (pp. 244-245). Quite a few books have been published in the West on the progress of research and the current state of work on nuclear weapons in the People’s Republic of China (PRC), its population numbering 1,339 billion. In 2009, I bought a 550-page book “When China Rules the World: The End of the Western World and the Birth of a New Global Order” by Martin Jacques (The Penguin Press, New York, 2009). From the text on the dust cover of the book, we find out that the author, Martin Jacques, an Englishman, “is a visiting professor at the Renmin University, Beijing, The International Centre for Chinese Studies, a Centre for the Study of International Affairs, Diplomacy and Grand Strategy, a visiting research fellow at the London School of Economics Asia Research Centre,” etc. Jacques’s book could not have appeared in former Soviet Russia because it undermines the very foundation of Stalin’s rule. According to Soviet propaganda, the Soviet working people had ruled their country since 1917, in contrast to Britain or the United States, ruled by their bourgeoisie! March with us as a single army! For battle, for battle, for battle! You are with us, though not in our columns! The two worlds are fighting each other at last. Our slogan is a World Soviet Union! In Soviet Russia, Jacques would have been shot by Lenin or Stalin for writing such a book, on charges of being a British secret intelligence agent. The final ambition of the ruling Soviet communist gangsters was to bring about the “communist revolution” all over the world — to remake the world in their own image. It hasn’t exactly worked out that way outside Russia. After Stalin’s death, the “invincible Soviet Union” as we know it ultimately ceased to exist, and for a little while, a couple of decades, there appeared an illusion of freedom in the country: people could travel all over the world and open their businesses. That illusion has been short-lived: the recent unrest in Russia has shown that the danger of returning dictatorship is quite real: Putin’s March 4, 2012, presidential victory seems to be a done deal. In his book, Martin Jacques argues that we in the West have barely begun to understand what life will be like when communist China rules the world. The widespread belief that China is becoming more like the West, that the world will be relatively little changed by China’s economic rise is deeply mistaken — in fact, an increasingly powerful communist China will seek to change the world in its own image. 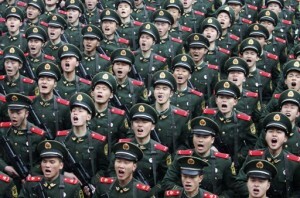 The likelihood that the rise of China’s military will change the world in the most profound ways has been ignored. President Obama’s pandering to China has underpinned American willingness to cooperate with China, open its markets to Chinese exports, and give access to the most sensitive American military technology previously out of limits to any outsider. And why should we assume that communist China will not use this new-found economic and military strength for its wider political, cultural, and military ends? The effects of China’s economic and military rise are being felt around the world, mainly in the falling price of many consumer products and the rise in commodity prices. Can a United States president regain the erstwhile American economic strength and save the unique American democratic values and its preeminent, strong military position in the world? My answer is yes, he/she can — only if President Obama, with his failed economic policies and his treacherous ways toward American military, loses his bid for the second term and thus will not have a chance to finish off what he left undone — the conversion of the United States into a Chinese colony.